Iraq's US-appointed interim leadership has banned an Arabic television station, accusing it of inciting violence against the coalition. Dubai-based al-Arabiya confirmed its Baghdad bureau had been forcibly shut. "Al-Arabiya incites murder because it's calling for killings through the voice of Saddam Hussein," said the current head of Iraq's Governing Council. 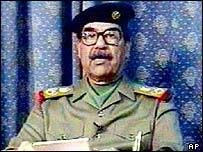 On 16 November the channel broadcast a recorded message said to be from Saddam which called for new "resistance". The speaker on the audio recording also described Iraqis co-operating with the US-led coalition as "scabby dogs that accompany or follow the caravan". Jalal Talabani, the head of the Iraqi Governing Council (IGC), said al-Arabiya would be banned for a "certain period of time" but did not specify. He said the IGC would also sue the TV network through the Iraq courts. But the station rejected the charge that its broadcast incited murder. "Al-Arabiya regrets this surprising measure and rejects the violence incitement charge by the interim Governing Council and confirms that its policy adhered and still adheres to covering the news in an objective and precise manner," said the channel in a statement. In September, the IGC introduced a law banning the media from inciting violence. It banned al-Arabiya and al-Jazeera television stations from reporting on government activities for two weeks after they broadcast earlier messages purported to be from the ousted Iraqi president. The media rules were criticised by Western-based media watchdogs but praised by the US Government. Last week, US Defence Secretary Donald Rumsfeld described al-Arabiya and al-Jazeera as "violently anti-coalition". The US Central Intelligence Agency said it could not verify whether the tape broadcast on al-Arabiya on 16 November was actually the voice of Saddam Hussein.